It is becoming more and more popular to invest in a ceiling fan that includes lights. However, it is extremely difficult to find the best ceiling fan with lights that fits your home décor. If you decide to opt-in for a kit with a light, it will help illuminate as well as add elegance to your home. There are some models on the market today that are built with some incorporated lights. However, there are other models that are built to fit into universal kits. What that means is that you can buy a ceiling fan without any lights, but you can buy it later and mount it on the fan. Have in mind that it all depends on the design and model of the fan. The light can be above the fan or below the fan. Models with lights provide many advantages, and you will be in full control of how you use the entire unit. You will be able to use just the light, just the fan or both working together. Having said that, if your desired ceiling fan has light, you can maximize its performance as a fan and illumination kit. However, the fan does not include a light, go the extra mile and do a little research. The truth is that many ceiling fan companies might sell lighting kits separately. If you want a unit with a light, have a look at the top rated ceiling fans with lights here below and see if you can spot something that fits your needs perfectly. The first item on our light list is the beautiful, modern and sleek Hunter Fan 52106. As you can see from the pictures, it is attractively designed from metal and the nickel texture gives it an eye-catching look for any room that you want to put it in. It does the job using 120 volts and 60W incandescent light bulbs, and the light bulbs are included. Some users did mention that the included bulbs are very bright and some of them replaced them with 4w LED lights. It includes two colored blades, and three-speed pull-down chains, with the total size of around 42″ and the dimension is 42″x42″x14.5″ with the total weight of 18 pounds. Now, if we dig deeper into the performance, the most important factor that current owners like is how quiet this fan is. It features a state-of-the-art, powerful WhisperWind Motor that delivers powerful, but silent efficiency. Even though it boasts an effective motor, and spins extremely fast, but you will only hear a whisper that won’t bother anyone. Another feature that current owners are thrilled about is the awesome Dust Armor Nanotechnology. With this technology, there will be no dust building up on the blades, and therefore, no dust from the blades will spray around the room. Also, the cleaning process will be much easier as there will be no dust to clean off the blades. Overall, the Hunter Company stands by their products and the powerful, yet silent and durable motor comes with a lifetime warranty. Apart from the motor, all pieces come with a limited 1-year warranty, and the Hunter Company provides one of the industry leading customer support that ensures that you will walk away satisfied after your purchase. This model is extremely easy to install, and if you are looking for a budget-friendly ceiling fan with strong light and an efficient motor, then I advise you to seriously consider this excellent product. Our second item is also from the Hunter Fan team, but slightly bigger than the previous model. It’s a whopping 52″ in size and weighs around 18.4 pounds and features 5 beautifully crafted blades that can be set to spin in reversible direction. You’ll be able to choose from 3 speed levels (low, medium and high). You’ll be pleasantly surprised by the amount of air that the blades are capable of pushing down. Included in the package are 3x light bulbs that provide plenty of light to illuminate any room regardless of its size. Due to its wingspan of 52″, it is developed to provide excellent efficiency in large rooms (up to 485 square feet). It features easy-to-install mounting kit designed for standard, flush or angled mounting, depending on your ceiling height and shape. As you can see from the pictures, it comes with 3 light fixtures and includes 3x 60watt bulbs to provide maximum illumination. Current owners are thrilled with the unique Hunter motor technology. This technology is going to ensure that the motor will provide wobble-free experience and continue to be quiet for life. The reversible function will make sure that you can customize your desired comfort level any time of the year. To confirm its quality and durability, the Hunter production team will provide you with a limited Lifetime Motor Warranty in case you run into any problems. Overall, here we have a cutting edge artwork and beautifully engineered ceiling fan to satisfy your expectations. When it comes down to functionality, the Hunter Fan Company has done a great job providing us with an ergonomically and stylish ceiling fan that was designed to reduce your utility bills thanks to its reversible switch. Furthermore, the reversible rotation is a handy feature that makes this one of the highly sought-out budget-friendly ceiling fan on the market today. Let’s move on to the Litex E-UB48BC4C1. Here we have a brilliant ceiling fan that was developed both for long-term use, as well as efficiency. This unit provides air circulation on a scale that other companies find hard to beat. Being able to move air so efficiently, while maintaining a remarkable degree of energy savings, is going to return a lower utility bill for you. What’s more, you will find an extensive manufacturer’s warranty. Along with top-rated warranty, you will enjoy elegant and cutting-edge metal design that will turn your room into a lot more innovative and stylish place. Featuring a 48″ blade span, this product has become one of the best ceiling fans with lights because of its recognized performance. The Litex is extremely powerful but quiet, and if you set it to max speed, the fan is capable of moving 5884 cubic feet of air per minute. You might be thinking that it must spend a lot of electricity to move that amount of air. However, it employs 73watts to reach its function of circulating just about 80 cubic feet p/minute per watt. It is then on the list of energy efficient 48″ ceiling fans. You can even cut down the bill further by changing the light bulbs to LED. Overall, here is among the greatest ceiling fans sold today. Top-rated engineering that was built to last for many years to come. The Ellington Company will provide you with a 15-year limited warranty that includes all parts and the motor. That way, you can rest assured that you are buying a product that will serve you for years to come. Durable manufacturing and long warranty ensure optimal volume of air movement when, at the same time, cuts down your electricity bill. Next up is one of the most popular ceiling fan on the market today. This classy and stylish model features a durable steel finish motor that spins 5 blades that you can reverse to match the look in your room. If you flip the blades, you can choose between white and silver blades. Below the blades, in the middle, is a beautiful glass light kit and long pull chains to operate the light and speed levels. This light kit includes 2x 60W bulbs and bear in mind that if you are planning on using this as your primary light in any room, there is a chance that you might want to opt-in for more powerful light bulbs. Overall, it is almost impossible to find any negative reviews about this model. The performance is first class as this model is extremely quiet and circulates the air by providing fantastic airflow throughout the room. Once you turn the speed to the maximum level, you will be pleasantly surprised how the fan simply whispers. It will turn any room into a contemporary and elegant area. This unit is ideal for those who are looking for a low profile fan, or those who are on the look-out for a fan to fit a room with a low ceiling. The Casa Habitat has done a wonderful job to provide an excellent product at a reasonably priced scale and most of all, a quality and quiet model. Our next model, the Westinghouse Comet 7801665, is a highly effective fan that was built for spacious rooms. Here we have a 52-inch, reversible fan that includes 5 sturdy built blades that will help to maintain effective air circulation in a room up to 360 sq feet. You’ll be able to select three different speed levels and also, there is a reversible button to maximize its airflow circulation during the whole year. This model, like many others on the market today, includes light and comes with a beautiful glass shade fixture and includes 2x 40Watt light bulbs. This fan can be used with a remote control (sold separately), or you can easily synchronize it with your smartphone, making this an excellent solution for those who want to be able to operate the fan without moving a muscle. Overall, it doesn’t take much investigation to conclude on the quality and functionality of this product. Current owners are extremely happy with this fan, and it is receiving raving reviews from happy customers. You won’t find many ceiling fans in this quality category at this price. The price is simply hard to beat. Here we have a quality product that provides stylish look and superb performance that is well worth the money. On top of that, you’ll receive a lifetime warranty on the motor, plus a two-year, limited warranty on all product parts. Next product from Litex Industries, is a 44-Inch ceiling fan that includes beautiful 5 reversible. Moreover, there is a light kit included that is covered with a silver glass bowl. This unit happens to be thoroughly designed in order to deliver luxury and elegance. It is perfect for those who are looking for a fan to install in small or medium rooms. The dimensions (44 x 44 x 13inches) does go with the majority of spaces easily. Therefore, the Litex maintains a classy impression for most small to medium sized rooms. The Litex is so much more than just a beautifully crafted ceiling fan with brushed nickel fixture, but also it is developed with efficiency in mind. Here we have a fan that boasts a whisper quiet, and wobble free motor inside to ensure that you will be able to rely on finest efficiency and this top-rated performance does not come with a hefty price. You will be able to control three-speed levels (low, medium and high) using the pull-down chains. The installation process is user-friendly, as long as you follow the instructions to the letter and all the installation tools are included. With extra pairs of hands, you should be done in less than half hour. All in all, if you are searching for a beautiful ceiling fan that is ideal for small to medium size bedroom or lower clearance ceiling, the Litex might be your solution. This is a nice and quiet fan that includes high-end motor efficiency that really makes the air circulate the room in a quiet way. Additionally, you will be able to reverse the direction to move warm air around the space. By having the Reverse Function, you will be saving money on your utility bill and enjoy warm air circulation. On top of everything, this is one of the few units available that carries a lifetime warranty so you can rest assured that you are investing in a premium quality product! It was designed as an efficient and contemporary ceiling fan that delivers sparkling appearance and could be your best option if you are looking for a fan that mounts perfectly in rooms with a low ceiling. 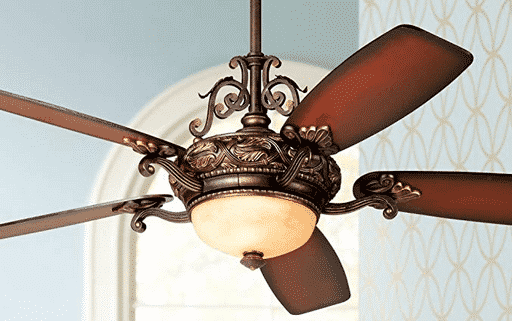 This is the 44″ Curva Sky from Emerson and here we have one of the most popular and elegant models in the ceiling fan market. This stunning unit features an opal glass light fixture that holds 2x 50W halogen bulbs that are included in the package. It comes with three sturdy all-weather blades that make this unit ideal both for indoor and outdoor use in any location (dry, damp or wet locations). It is extremely efficient in circulating air around the room and with the help of the powerful, but quiet motor and a 12-degree blade pitch, this unit is stamped for airflow rating of 4. With 5 being the best rating, this unit is capable of circulating air in a room up to 150 sq feet. You will be able to adjust the speed and light by using the 6-speed remote control that is included. Finally, to ensure that you are investing in a high-quality product, the Emerson team provides a lifetime warranty on the motor to make certain that the level of quality is as perfect as the visual appeals. The modern and low profile, three blade design will deliver elegance to any area in your home. Plus, it is designed for outdoor use as well. Have a look at this awesome fan if you are searching for one that delivers efficiency while spending less energy and gives you everything that you need in a ceiling fan. Next up is our favorite budget-friendly fan called Littleton from the Hampton Bay Team. This is a 42-inch ceiling fan that entails white coating and is absolutely perfect for living room or bedroom areas up to 10x10ft. It includes 4 reversible oak blades and features an energy efficient white-texture light kit that provides a stylish visual appeal that fits a number of different furnishings styles. It is very easy to mount it to any ceiling, and you will receive all the tools you need to install the fan. It includes all the basic features you need in a fan such as pull chain to control 3 speed levels, reversible operation, light bulbs are included and a lifetime motor warranty. The performance is also quite impressive if you look at the efficiency of the motor. The motor will power up the blades to produce up to 3600 CFM airflow. The only missing feature that current owners mention is that this unit does not come with a remote control. Don’t let the cheap price tag fool you. Although this fan is very cheap, it doesn’t mean that it won’t work. It has been getting thumbs-up by consumers and overall, this is an efficient and good quality solution for those who are searching for a cheap way to cool down at home. It is not the most sophisticated fan on the market, but this one is the best-priced fan on the market for the purpose it serves. Here is another fantastic unit and one of the most popular ceiling fans on the market today. It is the mighty 52″ Windward IV that features the newest innovation on the market. This unit will save up to 75 percent more energy than other fans, simply by incorporating a high-efficiency blade technology. On top of the huge energy savings, the Windward circulates up to 40% more air than other brands and at the same time, provides wobble-free and silent operation. Here we have a straightforward, but a modern style that features a built-in light kit that holds 2x 13watt bulbs. The key to its superb performance lies in the motor and the blades. The blades are designed to operate at a steeper pitch that will generate more air circulation around the room. This model will help you to cut down on your utility bill as it provides a reverse functionality. Using the 3-speed level reverse element, you will be able to enjoy luxury throughout the year, knowing this fan will serve you for many years to come. To add even more comfort to the user experience, you’ll receive a sophisticated remote to be able to operate all the functions from the palm of your hand, wherever you are in the room. You can control the speed level from low – high, and all the light functions, such as turning the lights on and off. You can even program the fan through the remote to turn on or off if it reaches your preferred heat range. Overall, this is one of the premium fans on the market, and it includes tons of bells and whistles. The motor comes with a lifetime warranty, and this model is Energy Star approved to ensure maximum efficiency by spending less energy to save you money in the long run. The 30-inch Arcadia from Hardware House has been receiving great reviews from current owners that were looking for a quality fan for a small room. It boasts an impressive and streamlined design, and you can choose between white, bronze or nickel texture. 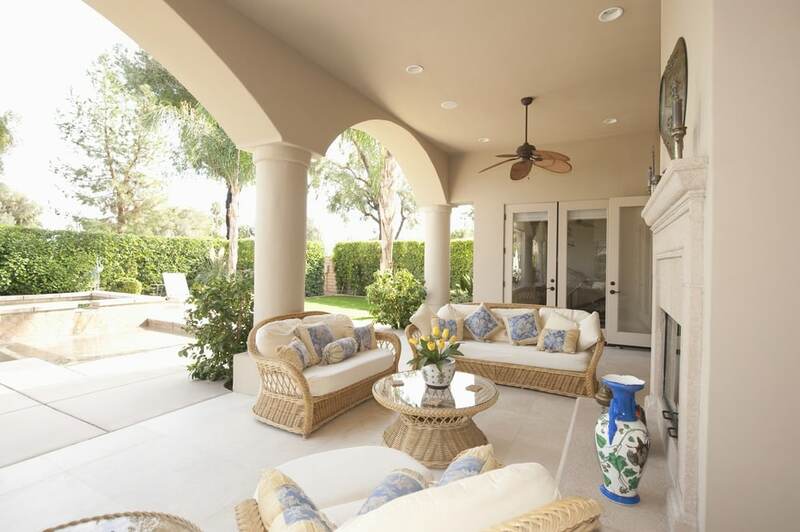 The Arcadia provides excellent volume of air circulation, when at the same time, sustaining a high level of energy savings that will lower your utility bill. The product features include all the basic things you will need to enjoy warm/cool air circulation in your home. You can control the speed and light by using the pull chains. You can also set the fan to provide reversible air circulation to ensure convenience all year long. This model is capable of produce 3900 CFM air circulation by using only 45Watts. Evidently, producing 87 CFM/watt air flow efficiency makes the Arcadia one of the environment-friendly units on the market today. All in all, you’ll get a beautiful fan with 6 reversible blades and a light kit that is shaped like a mushroom. You can install the cap with or without light depending on your preference. Have in mind that you will need to invest in a 60W bulb after you purchase as it is not included. On top of all these great features, you are covered by a lifetime limited warranty. Use the Brookhurst to acquire a conventional effect for your household’s design. This brilliant product contains 5 two-sided maple/walnut blades as well as a bronze coating that satisfies a large selection of furnishings variations. It contains an extremely powerful motor that provides top-rated and silent performance. The light kit consists of 3 CFL bulbs and glass bowls to furnish charming illumination within your rooms. The 5 (Reversible) blades allow it to become an easy process to evolve your interior decoration preferences without having to purchase brand new blades. The Brookhurst is ideal for spacious rooms, large rooms up to 20ftx20ft. The motor is able to produce 4500 CFM airflow using its 5 massive 52inch blade. In summary, the Brookhurst offers extremely quiet performance and you will not have to worry about any wobbling after installation, as long as you follow the instruction to the letter. The quiet, but efficient performance is the result of brilliant work between the 160 RPM motor and the durable 5 blades that simply provide extreme air movement in any large room. Consumers are extremely happy with the look and performance of the 52 inch Brookhurst ceiling fan. If you are looking for something different you can read our guide to different ceiling fan types here or go straight to the ceiling fan review section here. After reading through the top list of the best ceiling fans with lights here above, you should be able to make an informed decision on what style fits your home. Just by adding a fan with a light kit, you will add so much style to your room. Today, ceiling fans that include light are getting extremely popular and therefore they are getting cheaper as well. Some models are even cheaper than those who do not include light. However, this all depends on the quality and manufacturer of the ceiling fan. At last, I hope you found your perfect unit, with a light that satisfies your style and becomes a beautiful décor in your home.